I taught some beading classes a couple weeks ago…to some ladies…in the Caribbean….on a CRUISE! Boy, beading sure is nice, but floating in the sun on a ship that's filled with other beaders and loaded with a never-ending supply of delicious food is downright decadent. And what fun to spend time with my fellow teachers Tracy Stanley, Dallas Lovett, Marcia DeCoster, Bev Hermann, and Heather Powers. We had some great conversations and compared notes about the best ways to travel with tools, especially on a trip like this, where although decadence rules, space is a high commodity. Packing for a trip like this is an interesting challenge because you not only have to think about baggage weight and conforming to the TSA standards in the airports, but you're also dealing with U.S. Customs and cruise-line security. Then, when you get to your room, you've got a challenge to store your bags in an efficient way so that you can easily get them out and head to the classroom. All these constrictions make it important to think carefully about which tools to bring: the Makita or the Dremel? Five steel blocks or just one for everyone to share? One large spool of FireLine or dozens? 1) This tool has turn screws on each end with sharp punches at their tips. 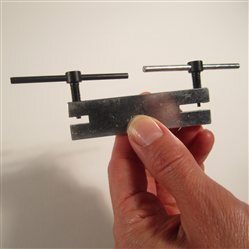 On this version, one screw punch is larger than the other; one makes a 1.5mm hole, the other makes a 2.5mm hole. 2) In this photo, I'm turning the 1.5mm screw end into a little piece of machined steel. 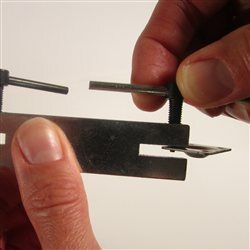 To begin, I set the metal piece within the tool, placing the punch point right at the place where I want the hole to be, then I slowly turn the screw until it pierces the metal all the way through. You might think you need to have strong hands to do this, but it's not really necessary; the screw mechanism does all the work. 3) Next, I turn the screw in the opposite direction until the punch removes itself from the piece of metal I'm working with. 4) And that's it! I've made a hole in the metal within seconds, no electricity, no mess, and this little tool is so small that it can be carried in your pocket. (Or you could throw it into your beach bag if you're on a cruise, of course! Great tool, eh? I was reminded of it when I was paging through the brand-new book Metal Style (in which my cruising buddy Tracy Stanley has a wonderful ring). 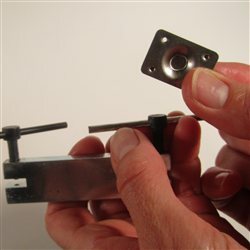 This is a collection of 20 very sophisticated projects made with basic metal-working methods, one of which is making holes in metal to set up for rivets or other metal-to-metal connections. (Enter the screw punch!) In fact, all of the jewelry designs are done with cold joins, good news for you traveling beaders; no torches necessary. It's a wonderful book for those of you who are looking for unique designs you can make with items you might have on hand, like wire, metal sheet, and simple findings. The step-by-step photos throughout the book are worth the purchase alone; they give the effect of having a jewelry-making class right in your own studio. I'd definitely check this one out.